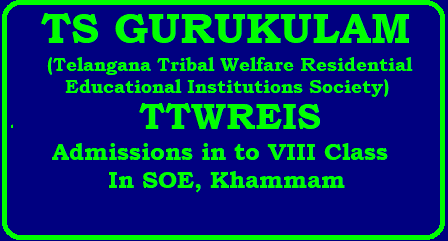 TELANGANA TRIBAL WELFARE RESIDENTIAL EDUCATIONAL INSTITUTIONS SOCIETY (GURUKULAM): HYDERABAD ADMISSION NOTIFICATION | Admissions in to VIII class for 90 seats in SOE, Khammam for the academic Year 2018- 19. Admission process into Telangana Tribal Welfare Residential SOE, Khammam for the academic year 2018-19 for 90 seats. Applications are invited from Girls and Boys those who were completed 7th class through online for SOE, Khammam (Co-education) through the website http://www.tgtwgurukulam.telangana.gov.in an amount of Rs.30/- will be collected from each candidate while applying for screening test, candidate can apply through online at the nearby TTWR School or any Meeseva Centre. A screening test will be conducted for admission into 8th class SOE, Khammam separately and allotment of seats will be done through online on merit basis only. A screening test will be conducted for admissions into entry point 8th class SOE, Khammam. The pattern of the question paper is as follows. The test will be for 100 marks in objective type based on the previous year syllabus. The Weightage of marks for different subjects and form of questions is furnished here under. TTWREI Society (Gurukulam), Hyderabad has to be issued an advertisement regarding admissions into SOE, Khammam (Co-educaytion) for 90 seats during the academic year 2018-19 in reputed and leading daily news papers. However, the Principals have to give wide publicity regarding the admissions. “School of Excellence, Pulipati Prasad Engineering College, Tanikella (V), Khammam District , Telangana State. Cell No. 9490957283”. Telangana State studying 7th class (English/Telugu Medium) during the year 2017-18 in TW Residential Schools, Ashram Schools, Govt. Schools and other Govt. Recognized schools. The application procedure is only through online and the applicant should visit the Gurukulam web site: www.tgtwgurukulam.telangana.gov.in. They have to apply for the admission into SOE, Khammam (Co-education) with Rs.30/- for each application, which has to be paid through online only. 1. 100% Seats are reserved for STs only in SOE, Khammam,totalseats are available for 90 only. 2. 70% Seats are reserved for Boys and 30% Seats are reserved for Girls in SOE, Khammam.